Summertime heat has returned and we are going to feel every bit of it today. The high temp will hit close to 95°, with heat index values pushing into the upper 90°s. Any rain showers or storms popping up over us will be caused by daytime heating and the breaking of the cap. Where they’ll form is anyone’s guess. The HRRR (below) takes its shot at a prediction. If you get caught beneath one of these storms, you can expect a quick downpour, gusty winds and plenty of lightning. Storms lingering past sunset will diminish quickly. The past several days featured daytime heat driven storms popping up in random, unpredictable places. This changes starting Wednesday, when an actual trackable feature will spark up some showers and storms. 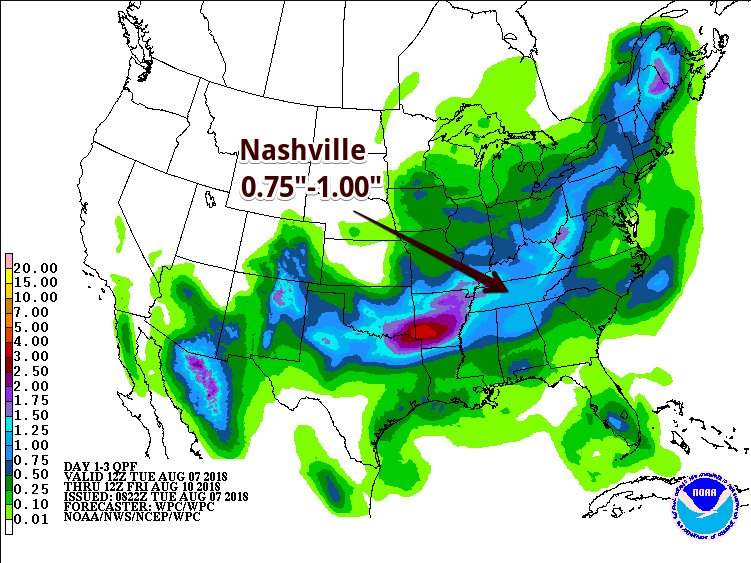 An upper high building over the midwest will slowly push an active, rainmaking frontal boundary down through Middle Tennessee starting Wednesday. What does this mean? Plenty of rain through the end of the week. With more clouds tossing shade, high temps will dip to 89° Wednesday. The front will likely stall right over us bringing widespread rain chances into the forecast. Thunderstorms will be likely at times Wednesday through at least Thursday along the slow moving frontal zone. Moisture convergence along the front will bring precipitable water near 2 inches, so some heavy downpours can be expected. At this time, we do not expect widespread flooding. Areal average rainfall totals for Wednesday through Thursday will be around 1 inch, but some locations will certainly have locally greater amounts from thunderstorm downpours. We can expect to see some thunderstorms Wednesday and Thursday, but for the most part it’s going to be a soggy end to the week. No real severe weather expected. This weekend we return to more scattered, mostly-afternoon rain chances. Typical Summer Week Ahead, feat. Rain Finally, Some Rain!